One of my closest friends is having a baby and I could not be more excited. Not only am I thrilled to share the joys and challenges of motherhood with her, I was also stoked to bake delicious treats for her baby shower. The theme was Cinco de Mayo because it was held on May 5th... but also, what makes a baby shower more festive than slushy momgaritas? So I figured, what better treat than margarita cupcakes?! I did some searching and found a recipe that seemed simple... which I really needed since I was making not only margarita cupcakes, but also mexican chocolate cupcakes and cheesecake truffle pops. Yup, I go all out. For her, I'd do anything. So let's start with the margarita cupcakes, I used a recipe from my tried and true iambaker site. I used vanilla cake instead of lemon and I omitted the tequila, though I'm sure this would have made them really taste 'margarita'esque... I figured I didn't want to push any buttons at a baby shower. Mix all of the ingredients together in a mixer. Fill cupcakes liners 3/4 way full and bake for about 18 minutes at 350 degrees. I wanted these cupcakes to stay fresh and delicious, and because I made these the day before the shower, I made a quick key lime simple syrup to brush on the tops of each cupcake. I then frosted them with a lime buttercream. Yum! To make the lime buttercream, make your basic buttercream (1 cup butter, 5-6 cups icing sugar, 3-6 tbsp milk) but cut back on the milk and add lime juice and lime zest. 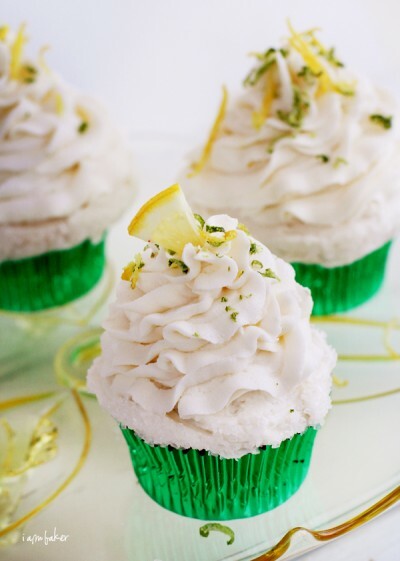 Also, a tablespoon of tequila would go a long way to making these true margarita cupcakes.